If you’ve perfected John McEnroe’s temper tantrums, but not his incredible skill on the court, chances are you need to up your tennis game … and buy a new racket. With tennis pros designing consumer versions of their own rackets, new equipment with helpful sensors built in and some rackets that are so light and powerful they feel as if they have given your ailing game a new lease of life, there’s no better time to invest. 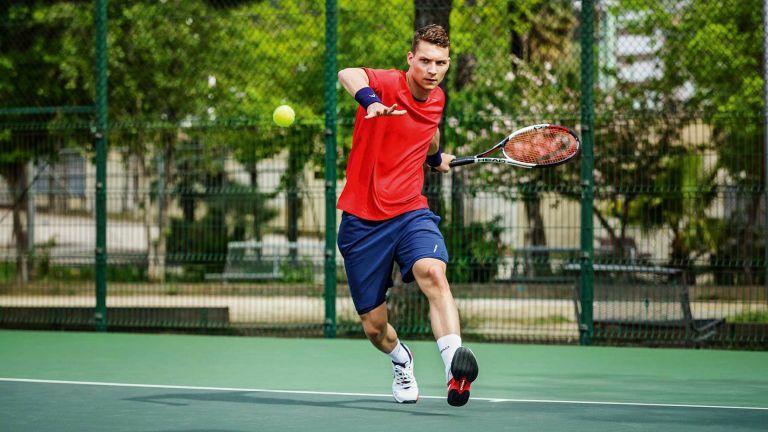 We’ve rounded up our favourites that will have you serving like Djokovic and volleying like Murray (well, you can dream) in time for Wimbledon. While ‘classic’ tennis players may have been admired for their precision, now-a-days a big-hitting, aggressive game is a must. Wilson’s Blade 98 racket comes in different iterations, but they all have a minimalist matte look and Countervail technology to maximise a player's energy – handy if you’re returning to the court after a hiatus. Wilson says the design focuses on the essentials, stripping away unnecessary elements for a timeless look and more importantly, a ‘psychological edge for the player bold enough to pick one up.’ All the rackets in the Blade range are constructed from braided graphite and basalt – an elastic material that Wilson says improves the flex of the racket. Players who opt for the slightly-pricier Blade 98S can also take advantage of ‘Spin Effect Technology’ which increases ball RPM without players having to change their swing. For those that like to look good on the court, Head’s limited edition Graphene XT Radical racket is as flamboyant as Nick Kyrgios’ style of play. Its colour palette is inspired by the adventurous nightlife of Florida’s party capital Miami, including ‘crazy flamingo’, ‘neon yellow’ and ‘lagoon blue’. But it’s not just pretty. The racket has innovative Graphene XT technology, which ‘allows an improved distribution of weight for a more powerful game and an improved energy transfer,’ according to Head. It also features a 16/19 string pattern for spin. The racket launched in March and there are only a small number left, as the special colour combination is limited to 10,000 rackets. It may not have a tennis pro’s name attached to it, or be the most glamorous design, but Slazenger’s Pro tennis racket offers a lot of the features of more expensive offerings. With a soft handle for comfortable play, it’s made of lightweight graphite a little like the top offerings of Wilson and Head, and has a 16 x 19 string pattern, which is the preferred choice of many pros because it’s meant to offer better control along with power. It’s ideal for beginners who may not want to commit their cash to the sport just yet, until they get good, that is. Imagine having Rafael Nadal as a mentor. Well now you can, kind-of. Babolat has created a smart version of the Spanish tennis star’s racket called Pure Aero Play that’s packed with tech to give players an overview of their game on their smartphone. Endorsed by Nadal, the racket has a six axis sensor, accelerometer, gyroscope, and battery built into its handle, which lasts for six hours. It’s designed to let players analyse all aspects of their game, including power, endurance and technique and even learn how hard they can serve and return a ball. Thanks to the app, players can set targets and earn badges for breaking personal records as well as share their performance online and compare it to others in the Babolat community – even the pros. Novak Djokovic is one of the best tennis players in the world so any tennis racket recommended by him must be pretty good, right? Head’s Speed Pro combines top technologies with design elements inspired by the tennis pro’s favourite animal – the falcon. Yes, you read that correctly. The design includes a ‘stealth pattern’ and falcon head integrated into the SPEED logo. But more importantly, it also makes use of Head’s Graphene Touch technology for a solid dampened feel and great sound, while the 18/20 string pattern gives players extra control. Built for speed, the racket promises ‘less shock, more wow’ which can only help impress at the local park. A solid choice for an intermediate player. Babolat’s Aero G Intermediate Graphite is inspired by its professional-level Pure Aero range and is made from 100 per cent graphite. While it’s designed to be high performance, it’s also intended to help improvers up their game by making it easier to add spin like the pros. The racket weighs 275g and has an ‘Aeromodular profile’ with ‘Woofert system’ which may sound like add-ons for a super hero, but Babolat says equate to power, forgiveness and spin. While it may not have the techie-extras of some Babolat offerings, the Aero G Intermediate has been praised as a good all-rounder that’s far from basic. This mouthful of a racket is the ultimate refinement of Wilson’s Blade range. Sure, it looks similar to the others, but look carefully and you’ll see the all-important signature of tennis supremo Serena Williams. Both Venus and Serena had design input into the Blade range, but the Autograph version is modelled on the personal racket Serena used to win her 23rd grand slam, so you’d hope it would help you out on court too. The racket has a large head size that Wilson says ‘enhances the sweet spot for pure strikes’ as well as a dense string pattern for good control. ‘This signature racket embodies everything a legend is and boldly inspires others to make their own mark on the world,’ the company claims. Female tennis players like Maria Sharapova may supplement their winnings by modelling jewellery, but they tend to stick to practical rackets on court. However, for players who like to dazzle in more ways than their game, there’s a new racket encrusted with crystals. Launched in January this year, Bijou’s Goddess Collection is the brainchild of Agnese Rozite, a US college tennis player with a love of fashion. The racket comes in three colours – rose gold, silver and gold – and is inspired by ‘New York skyline where lights sparkle like crystals’. Each is hand painted and is embellished with 160 Swarovski crystals. The company says the frame is made of the same fibres used in luxury cars but it’s looks that matter and super wealthy tennis fans can even customise frames with precious gemstones. While the rackets may not be the most high tech, they’re claimed to be the priciest consumer offering on the market and are definitely best when it comes to bling (if that’s your thing).